A landmark conference on climate change turned out to be another show of the arrogance and insensitivity of the Western powers led by the United States. Leaders of developing countries and environmentalists left Copenhagen disappointed. The summit could not produce an inspiring global climate change mitigation regime. As matters stand uncertainty prevails. 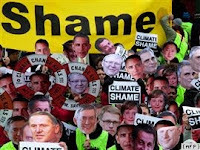 What they thought would be a landmark conference on climate change turned out to be another show of the arrogance and insensitivity of the Western powers led by the United States. China did not fair any better, despite committing itself to reducing emissions just as India and Brazil did. What also emerged is that Europe and Japan cannot have their own minds on major global issues without the endorsement of the United States. The United States' stance on climate change has been particularly disappointing. It could not be part of the Kyoto Protocol a decade ago. We all thought this position would change with the coming into power of the Obama administration. Obama had promised during his election campaign that he was going to Washington to change Washington and that he would not pander to the whims of interest groups in Washington. Hardly a year after coming into office, Washington has changed him and he is now a slave of these interest groups. Rightfully, he is being criticised for failing to offer firm leadership on issues that matter most. He did run around in Copenhagen but at the end of the day produced nothing praiseworthy. The claim that the Western countries are champions of human rights and that they care most about the well-being and welfare of people have been proved to be just empty rhetoric. How could they claim to care when they cannot commit themselves to a deal that could save whole countries that are threatened with extinction due to climate change? A number of coral islands could sink under the waters in the not-so-distant future. Their leaders made a loud appeal to the big powers to save them, but were not heard. President Mugabe, who is known for not mincing his words on major issues, was once again a voice for the oppressed. "Why is the guilty North not showing the same fundamentalist spirit it exhibits in our developing countries on human rights matters on this more menacing question of climate change?" he asked. "Where is its commitment to retributive justice, which we see it applying on other issues placed on the global agenda? Where are the sanctions for offenders? When we spit at the Kyoto Protocol by seeking retreat from its dictates, or simply refusing to accede to it, are we not undermining the rule of global law?" The hard-hitting speeches and demonstrations by activists could not move the hard-hearted Western leaders. They could not care enough about the droughts, floods and other forms of extreme weather conditions that have already started bringing misery to millions of people mostly in developing countries. While indeed the experts will continue to work on more acceptable measures ahead of the Germany meeting in June next year, what is needed most is a political declaration which will commit the developed countries to far-reaching climate change mitigation measures. Developing countries were right in insisting that the United States and its allies should ratify the Kyoto Protocol and keep it in place until 2013. We doubt if the next summit in Mexico in December next year will produce anything given the rigidity by the big powers that was displayed in Copenhagen. There was enough time in Copenhagen to hammer out a good deal. There was just not enough sense of global responsibility on the part of the big brothers from the North. Perhaps the citizens of those countries need to put more pressure on their leaders to be sensitive enough to the effects of the continued rise in atmospheric temperatures. By the time we get to Mexico in 2010 enough pressure must have been exerted on Western powers to agree to something that can save this planet for posterity.